If you own a rabbit hutch and keep your furry friends outdoors year round, when the cold temperatures and biting winds of winter come, you'll have to do something to protect them. 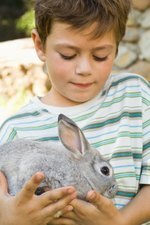 A hutch is a fine outdoor environment for rabbits, and with a few seasonal modifications, your rabbits will not only survive but will thrive during the cold winter months. Remember, wild rabbits survive over the winter all the time, so there's no reason that your domesticated ones shouldn't as well. Move your rabbit hutch to a place that is protected from the prevailing winter winds. Cold wind will freeze a rabbit far faster than the ambient temperature alone. Cover the hutch on three sides with a down filled blanket. Make sure the side that is not covered has the most protection from the wind. Cover the down blanket with a waterproof tarp. Water is the next greatest threat to a rabbit in the winter. Wet fur does not insulate the rabbit and allows body heat to escape rapidly. Add extra straw to the hutch, especially in the area where the rabbits bed. Extra straw is another added layer of insulation for your pets. Change this straw every other day to prevent moisture from building up in the sleeping area. If the rabbits don't already have a nesting box, this is a perfect time to add one. This could be as simple as a shoe box with and entry cut into one side. Invest in a thermal water bottle cover. This will keep the water in the bottle warm longer, so the rabbits will have more time to drink it. Check the water at least twice a day and fill it with lukewarm instead of cold water.